Tuesday October 13, from 6:00 – 9:00 pm opens a new exhibit by Art Kibbutz NY, and co-sponsored by the Jewish Art Salon. The Manny Cantor Center at NY’s Lower East Side will host the exhibit till December 1, 2015. This exhibition explores the dual role of art embedded in the environment and in Jewish identity. Selected works on display by Helène Aylon, Tobi Kahn, Leah Caroline, Larry Frankel, Ken Goldman (Israel), Cynthia Beth Rubin, Gil Lavi (Israel), Paul R. Solomon, Shay Arick (Israel), , Asherah Cinnamon, Shira Toren, Hila Amram (Israel), Jackie Brookner, Stephanie Osin Cohen, Filipe Cortez (Portugal), Susan Hoffman Fishman and Elena Kalman, Elisa Pritzker, Deanna Sirlin, and Renata Stein. The exhibit was curated by Aimee Rubensteen with curatorial assistance by Yona Verwer. (Jewish Art Salon members in bold). This exhibition highlights the complex and deeply rooted relationships featured artists’ have with the changing natural environment and to Jewish culture. Each artist, as an observer and participant, has an individual experience with their surrounding ecological system—Earth, Judaism, or both. These relationships are showcased through a wide survey of media—from unconventional raw materials, like dirt, branches and bones, to innovative technology, like Augmented Reality. Viewers are encouraged to participate in questioning and understanding the world around them as they experience the artists’ multiple perspectives and shared observations. The artists’ works range from Ken Goldman’s Dirty Jew, a self-portrait that depicts the Israeli artist proudly drenched in the organic waste of 350 milking cows, to Cynthia Beth Rubin’s Roots, which uses Augmented Reality to show source material such as plankton in water, an artwork she started developing at Art Kibbutz’s first residency program at Eden Village. Complete with conceptual and commissioned work, the exhibition also showcases the art of two pioneers of ecological art, Jackie Brookner and Helène Aylon, who have devoted decades to teaching art as activism and “rescuing” the body, the Earth, and G-d.
Exhibiting artists represent the Art Kibbutz community, and each has found a different, meaningful Jewish connection through the arts. Their work has been widely informed by their artist residency experiences at Art Kibbutz. Each residency program was created to harness and maximize residents’ creative work related to Jewish responses to the environment, farming, and sustainability. Visitors are encouraged to contemplate their own roots of their upbringing and environment. This incentive will be further realized in the upcoming Art Kibbutz Creative Catalyst symposium, which is dedicated to art activism in memory of Jackie Brookner, a former Art Kibbutz resident and activist. The opening reception will be on Tuesday, October 13th 2015, 6:00–9:00 PM. Exhibit on view Monday – Saturday 9-7, Sunday 10-6. Creative Catalyst symposium on Sunday, November 8th. More info soon. Art Kibbutz, founded in 2010, is an international Jewish artist residency and a community of over 500 artists. Its mission is to foster global arts conversation and exchange among artists of exceptional talent in an inspiring and peaceful space to work, learn, and explore the rich heritage of Jewish experience that informs their creative process. Art Kibbutz has had five successful artist residency programs and had been at the forefront of Jewish environmental movement giving creative responses from a Jewish perspective. 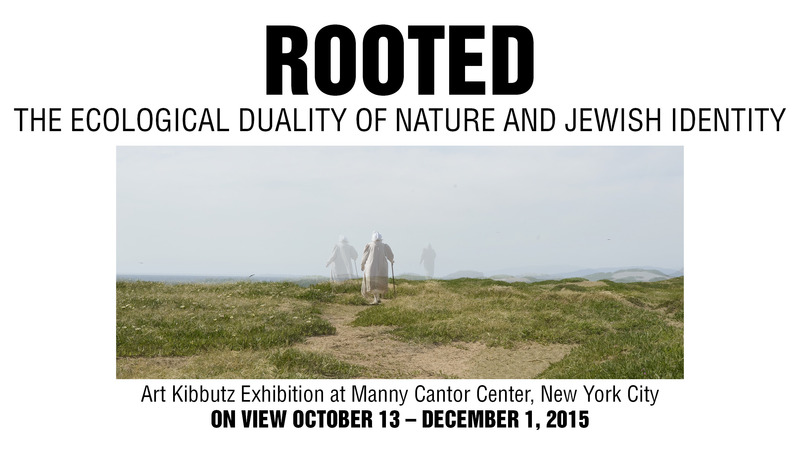 Art Kibbutz hosted the first Jewish land art, eco art residency at Eden Village in 2013 with 35 international artists which gave the core of the ‘Rooted’ exhibit, followed by another residency at the New Museum and three more on Governor’s Island. The Jewish Art Salon, founded in 2008, is an international artist-driven community that strives to promote understanding and appreciation of contemporary and innovative Jewish visual art. It uses the power of collaboration to provide important resources and programs that develop lasting partnerships with the global art community and the general public. The Jewish Art Salon builds community, as well as produces events. It organizes dynamic exhibits, inter-active art events, and (in the New York area) bi-monthly salon sessions engaging international artists and scholars, in order to create an appreciation for cutting-edge Jewish art. Aimee Rubensteen is a curator and writer living in New York City. She focuses on modern and contemporary art that utilizes unconventional materials and challenges traditional notions of Jewish identity. Her recent projects include curating Waiting in Wonder, a group exhibition that explored a traditional Jewish counting ritual through modern visual arts for a multi-purpose gallery in Brooklyn; and co-curating JOMIX- Jewish Comics; Art & Derivation, a survey of contemporary Jewish artists using comics as a medium to express and address their Jewish identity and cultural experience, currently on display at the Philadelphia Museum of Jewish Art, and organized by the Jewish Art Salon. Additionally, Aimee works at Sotheby’s as the Administrator of the Egyptian, Classical, and Western Asiatic Antiquities Department.